Street Views: 19 and 9 Suppl. 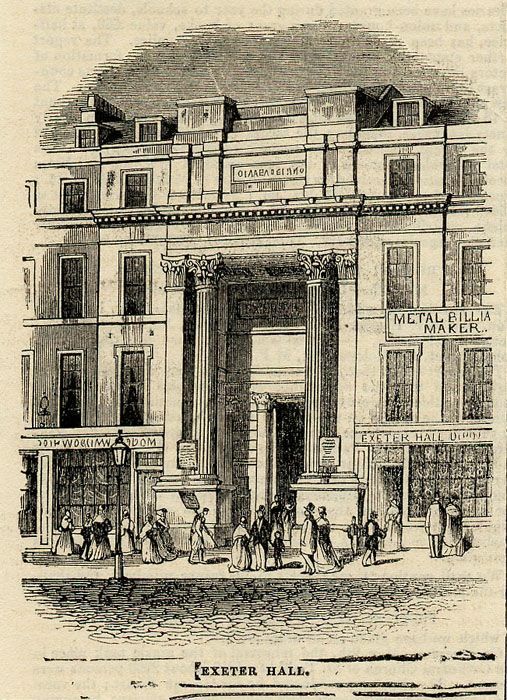 In the post for Edward Cahan, tailor, we saw that he occupied 371 Strand from ±1845 onwards and that he was listed by Tallis in the 1847 Street View Supplement. But in the main collection of Street Views (±1839-1840), Tallis listed S. Hunt & Co, tobacconists, at number 371. The elevation at the top of this post shows Hunt as a billiard table maker. Samuel Hunt combined both jobs, after all, what better place to sell your cigars than in a billiard room full of gentlemen? Although Cahan moved into number 371 at some point, Hunt continued to use most of the premises as his “billiard rooms and cigar divan”. According to London as it is today, cigar divans were “essentially coffee houses, but of a distingué character, expensive in their charges, and more studied, elegant, and luxurious in their appointments and conveniences”. Cahan probably just had the ground floor of number 371 and perhaps a few bedrooms upstairs. Various illustrations of the property before and after Cahan’s occupancy show the cigar divan on the ground floor of number 371 with the billiard rooms above. It looks as if Hunt rented out some space at number 371 to Cahan, while keeping the rest of the property for himself. Illustrated London News, 1843, showing the Exeter Hall divan on the right and the billiard maker above. 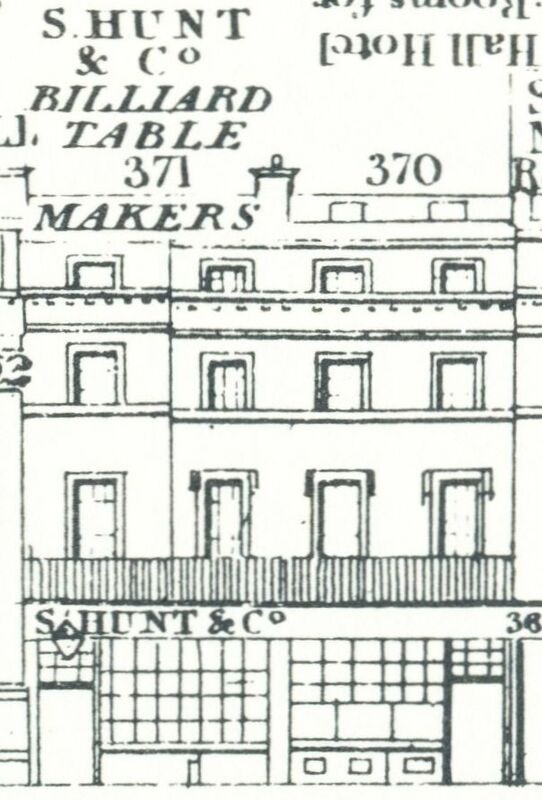 The neighbouring property at 370 Strand had been in the occupation of one Bennett, pastry cook and confectioner in the early Street View; we will find out what happened to him in a later post, but for now we are concentrating on Hunt & Co. They, that is S. and C.J. Hunt [Samuel and ?? 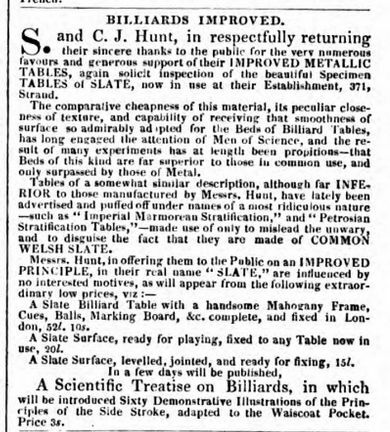 ], entered an advertisement in The Athenaeum of 1834 in which they warned their customers against inferior billiard tables that were advertised under “names of the most ridiculous nature – such as ‘Imperial Marmorean Stratification’ and ‘Petrosian Stratification Tables’ – made use of only to mislead the unwary, and to disguise the fact that they are made of COMMON WELSH SLATE”. As you can guess, the tables Hunt provided were anything but common, but made according to an improved principle, which needed no trumped-up names; the use of the word ‘slate’ was enough. The only thing to surpass the slate tables of Hunt were their metal tables. In the same advertisement, Hunt also advertised “A Scientific Treatise on Billards”. 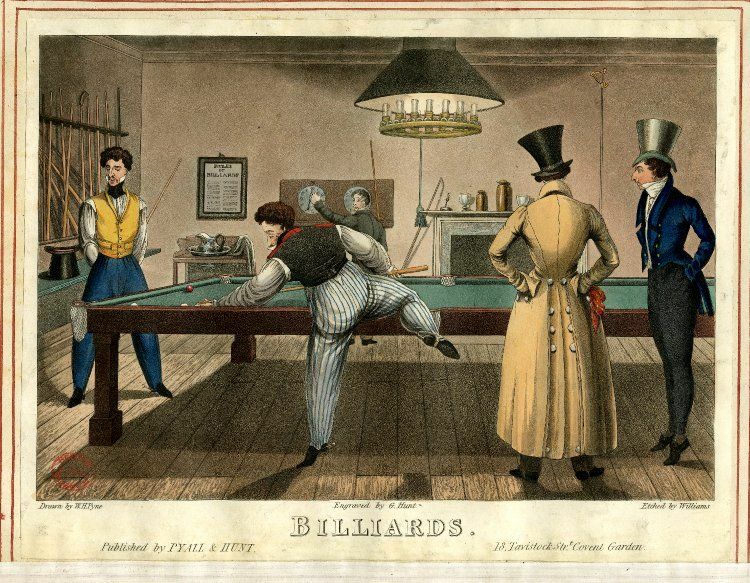 No author or proper title mentioned, but it was probably François Mingaud‘s The Noble Game of Billiards, a translation by John Thurston, rival billiard table maker, of the Noble Jeu de Billiard. Thurston, by the way, had an advertisement just above Hunt’s in The Athenaeum in which he advertised his ‘Imperial Petrosian Tables’ and also Migaud’s book. No love lost between the two rivals apparently. 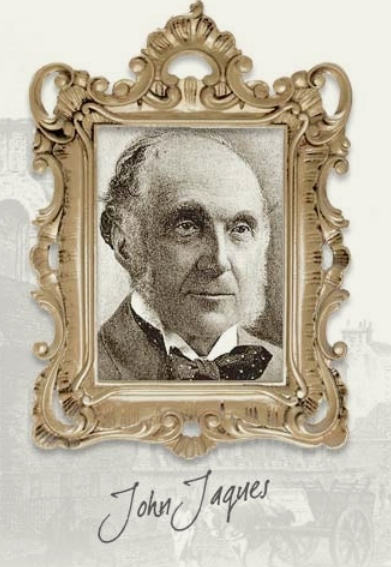 Samuel Hunt died in July 1845 of “disease of the lungs and debility”, just 48 years old. Horatio Nelson continued the business, at one point assisted by one John Drucquer, who had at one time had had his own tobacconist and billiard establishment at 334A Strand, but had fallen on hard times. (4) By 1850, Horatio must have left the tobacco side of the business to William Henry and Charles Russell who dissolve their partnership as tobacco and snuff dealers at 370 Strand in February 1850. (5) The billiard business was, however, still in Hunt’s hands and he is listed as billiard table keeper at number 370 in the 1851 census. At number 371, the census lists George Beckingham, also a billiard table keeper. What exactly the relationship was between Hunt and Beckingham is not clear, but it seems that Beckingham took over part of Hunt’s business as in 1859, The Building News of 15 July reported that 371 Strand, known as Beckenham’s Billiard-rooms, was sold for £1230. The Land Tax records still show Hunt at number 370 and Cahan at 371. The 1861 census shows Horatio and his family at number 370, but 371 is just occupied by a single lodger, so no great help in determining what happened. In the 1871 census, Horatio has moved to 2, Montague Place, and is described as billiard table maker, employing 5 men. He went bankrupt in 1878 and was then living at 11 Finborough Road, South Kensington. (6) He got himself out of trouble and continued to work as a billiard table maker/keeper, in 1881 at 6 Tavistock Street. He retired sometime between 1881 and 1891 as the 1891 census finds him living on his own means. He died in 1898. It is unclear what happened to 370 Strand just after Hunt left, but it came on the market in 1872 with an unexpired lease of 56 years. 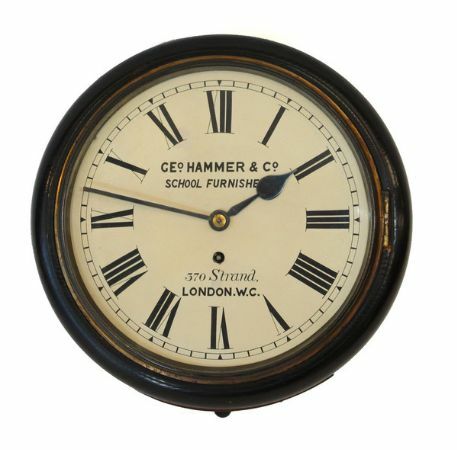 (7) It became part of the Exeter Hall Hotel, often referred to as Haxell’s Hotel after its proprietor Edward Nelson Haxell, but at some point it also housed George Hammer & Co’s, school furnishers. In the 1920s Haxell’s Hotel became part of the very grand Strand Palace Hotel, but that is another story. (1) Old Bailey case t18360919-2121. (2) The London Gazette, 16 November 1841. (3) The London Gazette, 29 September 1843. (4) The London Gazette, 6 February 1846. (5) The London Gazette, 5 February 1850. (6) The London Gazette, 19 February 1878. (7) The London Gazette, 3 September 1872. In 1821 at St. George’s, Bloomsbury, John Jaques of 102 Hatton Garden married Ann Danks, daughter of Thomas and Elizabeth Danks of 98 Hatton Garden. She was the sister of Michael Danks who continued the carpet business at number 98 and 99 after his father’s death (see here). John Jaques was the son of Thomas Jacques and Mary Phillips and was born on 13 October 1795 in Leather Lane. The family was of Huguenot descend and John’s birth was registered by the Protestant Dissenting (Baptist) Minister W. Smith at Eagle Street Chapel in Red Lion Square, also known as the Kingsgate Chapel. 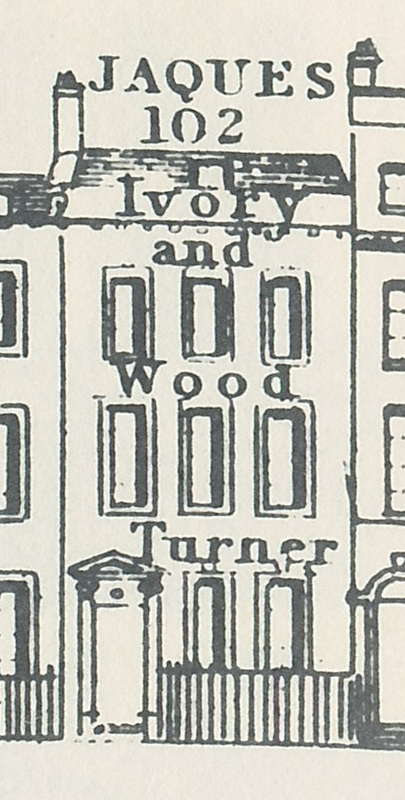 (1) Father Thomas Jaques was an ivory turner at 65 Leather Lane and son John followed in his footsteps. The back of a trade card in the British Museum collection, dated ±1814, shows us the range of items that could be obtained from Thomas Jaques’. Not unexpected were the ivory fans, billiard balls, ivory handles, boxes and cases, but perhaps more surprising are the games, such as Pope Joan, Back Gammon and Cribbage. 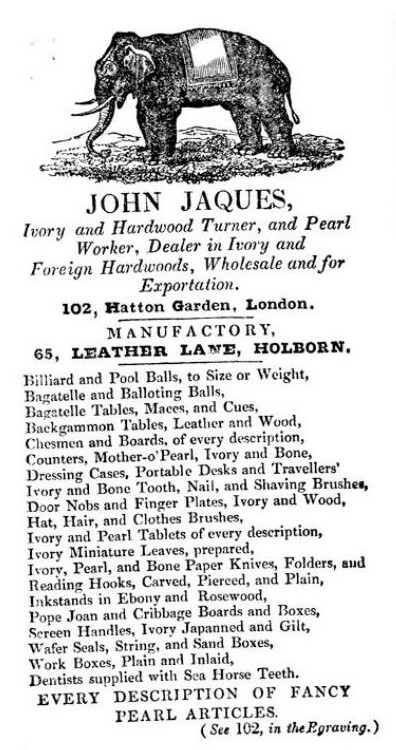 By the time Tallis’s Street Views came out, the firm had expanded to Hatton Garden and in the Tallis advertisement (above), it can clearly be seen that it was not just ivory they dealt in, but also hardwood and pearl. 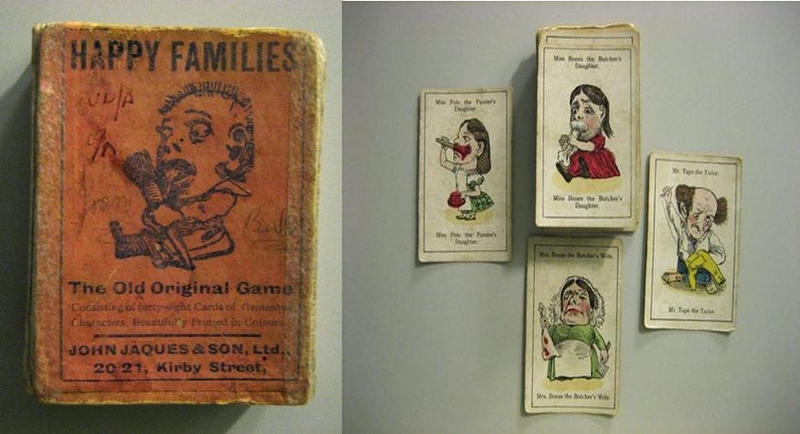 The list of items already shows a greater emphasis on games and that was what the firm became known for, especially John (II), the son of John and Ann, had a vivid imagination which allowed him to invent all sorts of games we still play. 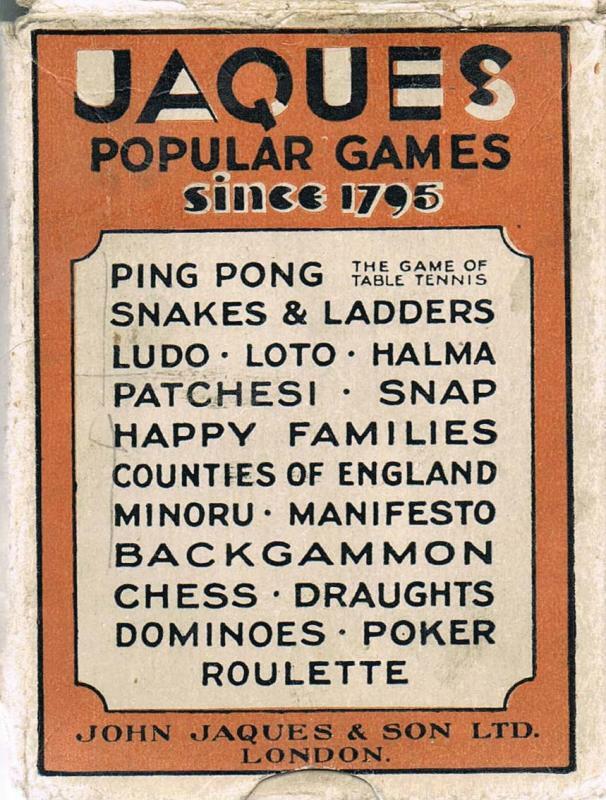 Around 1840, John (II) invented Happy Families; Snakes and Ladders, Ludo and Tiddledy-Winks were to follow. The 1841 census shows John (I) and Ann with daughter Mary and son John (II) living above the Hatton Garden shop, but in the 1851 census they are found at 78 Belitha Villas, Islington. On the 31st of January, 1860 John (II) marries Harriet Ingram Cooke at St. John’s, Notting Hill and the 1861 census sees the newly-weds at 4 Caroline Place. John (I) and Ann are then living at 31 Doughty Street. John (III) is born on 3 September 1862 and baptised in January 1863. 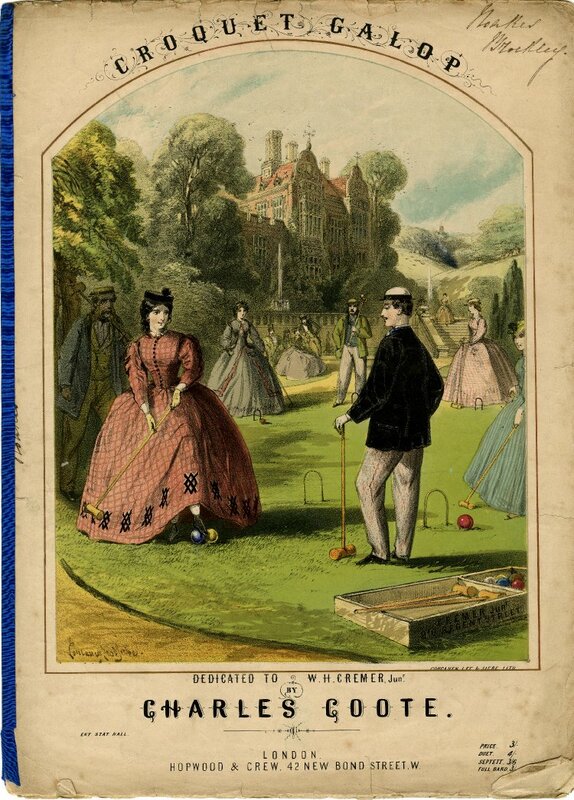 The Great Exhibition of 1851 was perhaps the watershed in the fortune of the Jacques firm as John (II) introduces a new game there for which he received a gold medal: croquet. Various forms of similar games had been played before, for instance in Ireland, but it was the version that Jaques introduced that became an enormous success. 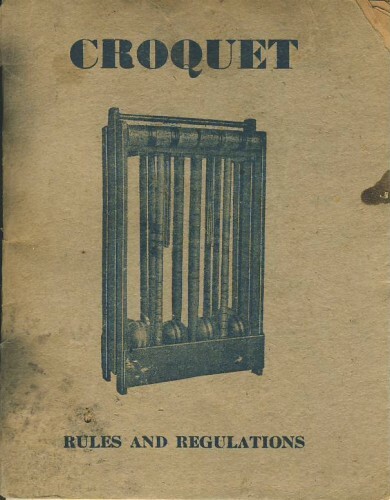 In 1862, he took out a patent on the game of “croquêt” – it was to lose its circumflex a few years later. Jaques was astute enough to sell complete kits from his shop which included a booklet with the rules. By 1867, sixty-five thousand rule books had been sold. One of the attractions of the game was the fact that it could be played by both sexes at the same time and also outdoors which gave it an air of informality. (1) The National Archives; Kew, General Register Office: Registers of Births, Marriages and Deaths surrendered to the Non-parochial Registers Commissions of 1837 and 1857; Class: RG 4; Piece: 4235. (2) Proceedings of the Old Bailey t18370612-1502, 12 June 1837. (3) England & Wales, National Probate Calendar (Index of Wills and Administrations), 1877. Probate granted 11 July 1877 to John (II) and David Henry Hastings, the executors (effects under £12,000). (4) England & Wales, National Probate Calendar (Index of Wills and Administrations), 1898. The executors were widow Harriet and Herbert Edgar Reid (effects just over £88,000). London Street Views by Baldwin Hamey is licensed under a Creative Commons Attribution-NonCommercial-NoDerivs 3.0 Unported License.